0.1 Are you an Employer? Over the last 15 years, the Crowdsourcing ecosystem has gotten huge (namely, over 70 million technical specialist worldwide), but finding the right freelancer for you is still considered to be a challenge. Where can you find and hire a trusted employee who wont disappear after a milestone payment? How do you know if your candidate is reliable and skilled enough? In terms of numbers alone, freelance marketplaces are a rich source of potential candidates. One of the oldest and most popular freelance websites around, workers on freelancer.com offer a variety of skills to meet every taste and budget. However, you shouldn’t limit yourself to only one website. There are more great platforms to consider. Here we reviewed the most popular Crowd Sourcing and freelancing website along with their pros and cons.. By the way, We have tried ALL of them. Introduction. Upwork is a marketplace that connects businesses to freelance specialists and agencies. In case you didn’t know already, Elance and Upwork are now the same platform, following the merger between Elance and oDesk. How does it work? The hiring process on Upwork is pretty simple: simply post a job and wait for freelancers to place their bids. In case you know exactly who you need, you can also invite certain known freelancers to bid personally. Once the applications are in, you can start the vetting process and review the skills, experience, profile strength, or hourly rates of the applicants on offer. To hire a developer, simply award the job to the chosen bidder. Detailed freelancer profiles. These include information about previous experience, job history, reviews, portfolio, independent skill tests, and overall job success rating. In-built communication and reporting (time tracking with screen captures) tools and payments. Fixed project and hourly job postings. Introduction: Toptal s another freelance marketplace that is worthy of our attention. The website offers access to the very best of freelance software developers and designers (the company claims to accept only the top 3% of the professionals who apply to join the platform). How does it work? You submit a job description and your requirements. The internal team at Toptal then handles the hiring process by matching you with the qualified freelancers they have on file. Rigorous screening process: the website features only the best, pre-selected freelancers. Risk-free trial period for every project (20 hours). Introduction: Gun.io relies on an algorithm-based staffing methodology to find the perfect candidates for every project. The platform currently has 25,000+ pre-screened freelancers “on the bench”. How does it work? Gun.io takes a slightly different approach to hiring software developers. The team acts as a virtual staffing agency, connecting businesses to available freelancers in their network. It also offers the possibility to hire complete development teams. The company also has provisions for taking care of project management, namely by staffing every team with a project leader. Community-based staffing: the company has an active community of freelancers on Slack and can instantly connect you with pre-screened candidates. Flexible pricing, sprint-based service payments. Introduction: Crew is a staffing platform that connects businesses with hand-picked freelancers within 24 hours. How does it work? The hiring process is handled by the internal team at Crew.co. After submitting your project description, the website representatives will contact you and define all the details about the project. After that, they will provide hand-picked candidates you can personally interview and hire. Speed. The website claims to provide the right candidate in just 24 hours. Features both freelancers and small development studios. Introduction: Gigster is an on-demand software development platform rather than a freelance marketplace. How does it work? The platform has a pre-vetted network of more than 350 freelance professionals you can connect with. The project estimation and developer selection process is handled with the help of artificial intelligence. Introduction: PeoplePerHour.com is a freelance marketplace similar to upwork.com and freelancer.com. How does it work? Customers can post job descriptions, after which the freelancers will submit their proposals. Alternatively, a customer can review the freelancers’ profiles or their hourly rates, then contact the most suitable candidates directly. Just like freelancer.com or Upwork, the website offers a full package service to manage the project and freelancers directly. Ability to post contests (especially useful for design projects), allowing you to review test tasks and choose the best submissions..
Transparent reviews and rating system. Introduction: Guru is another freelancer.com alternative with similar business principles and features. How does it work? Like most other freelance marketplaces, this platform offers a convenient way to post a project description and get offers from suitable candidates. The platform also allows its customers to get quotes directly from chosen providers without posting a job. Full package of in-built communication, collaboration, and project management tools. It’s completely free to post a job on Guru.com (except for featured postings). The platform focuses more on matching clients with software development companies instead of freelancers. Introduction: Unlike the previously listed marketplaces, CodementorX is an invite-only community of software development professionals. How does it work? CodementorX acts as a virtual staffing agent: Customer chat with a platform representative on a one-to-one basis and later receive a shortlist (usually 2-3 options) of recommended developers who are available for that job. Description: Workhoppers is a mix of a personal recruiter, traditional job board, and on-demand freelance hiring platform. How does it work? After getting in touch with a service representative and describing your open position or project, workhopper.com uses its proprietary algorithm to perform a fast and efficient vetting process. You will then get a curated list of recommended local professionals, after which you can negotiate and hire your software developer directly. Smart matching algorithm and guided hiring process. Introduction: Hubstaff Talent is an online catalogue of freelance specialists and agencies. How does it work? You can browse the list of providers by skill, location, or cost, and choose the freelancers or agencies that best suit you. The vetting and hiring process is conducted outside of the platform: as soon as you get in touch with the contractor, you can discuss the terms and start collaborating using any medium you want. No middleman: customers can connect directly with providers. Introduction: Loom is a freelance marketplace where you can hire freelancers to work with you for a stake in your project. How does it work? The platform has a hiring process similar to those of other freelance marketplaces. Customers post their job descriptions and select the best provider from the applicants. Flexible payment options (from to cash to shares). Focus on confidentiality (some parts of your project description can be shown to an applicant only with your permission). 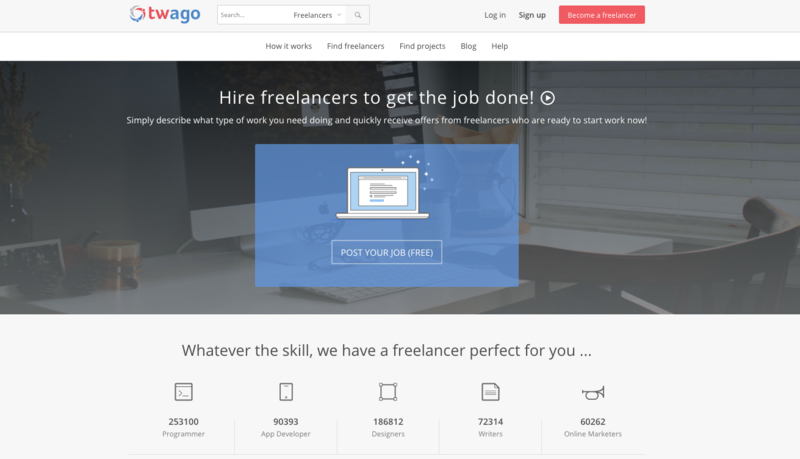 Introduction: Twago is a leading European freelance marketplace. How does it work? The hiring process is pretty straightforward: You post a job description, get quotes and offers from freelancers, conduct interviews, narrow down your selection, and then choose the best candidate. Freelancer profiles feature a section on work history and reviews, which make your choice easier. Integrated freelance workforce management tools. Are There Better Alternatives to Upwork?